Martina Navratilova is known around the world for the epic battles she waged on tennis courts. She won 18 Grand Slam singles titles, a record 31 Grand Slam women's doubles titles and 10 Grand Slam mixed doubles titles. She advanced to the Wimbledon singles final 12 times, including nine consecutive years from 1982-1990. Martina Navratilova is your Connector of the Day. But the toughest opponent she has ever faced has been off the court. Navratilova had been busy and neglected to get her regular mammograms for the past few years. During January of this year, she made a routine doctor's appointment and that's when cancer was spotted. 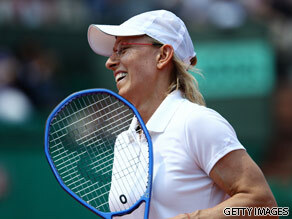 Navratilova underwent a lumpectomy in March - and completed six weeks of radiation in June. The tennis great allowed a CNN camera team to be alongside her as she tried to balance her treatments with her demanding daily routine at the French Open. She underwent her treatments in the morning, commentated for the Tennis Channel during the day, and spent her evenings playing Legends tennis. CNN has been granted rare access to one of the most recognized and successful female athletes in the world. Navratilova is sharing her story with the world, so she can inspire women to get their mammograms and take a more active role in their personal health. CNN will air Martina: My Toughest Opponent on Saturday, Aug 7, at 5:30p in London, 6:30p CET. Viewers will get to see a side of Martina they've never seen before. They'll see her travelling to her treatments while attempting to keep up her busy schedule. You will meet her doctor, see where she's getting treated and meet the group of friends who are determined to see her through this chapter in her life. Ahead of that, she's taking your questions as our Connector of the Day. What do you want to ask Martina Navratilova? What is your opinion on the way Barack Hussein Obama’s Administration is Improving the Health, Safety and Well-being of ALL Americans? We all know that the events in our lives, how we handle them, what we learn and how we grow, are part of what makes us who we are. Often the most profound self revelations come after years, or even decades of introspection. So it might be premature to ask this question, but is there anything you learned about yourself throughout this process that really surprised you? Like so many people, I have watched you playing tennis for years! do you ever think of God in relation to this present battle? Does He enter into this equation? what one thing that you have manged to do in your lifetime has given you the most satisfaction in doing whether it be tennis related or not? for example mine was the first time i learnt to play a song on the drums for the band i was in at the time. brought your book Shape your self it so inspired me. You are very brave to go public when you didn't have to. My mom had cancer when she was 42 and is now 67. Cancer can be beaten so there is always hope. I would like to ask you, "What is it like to win Wimbledon?" I have another question. Are you angry because of the cancer? If you are, it is okay to be angry and if you believe in God, it is also okay to be angry with God. I am 60 years old and had brestcancer last year. Besides 2 operations I had 25 radiations and 6 chemo therapie treatments. It has a big influence on my life. Did the brestcancer change your outlook on life? Are there things that you do different now? I hope you are well. My question is have you any plans to support breast cancer charities? tennis. Excitement and joy were the result each time you played. Bless you and keep playing! ...i wonder if there is one specific match in your amazing career....which you would like to do-over?? Martina, as a fellow breast cancer survivor, I want to both let you know that you have the mental strength and discipline to battle this in both your mind and body. But as a woman who might be used to 'toughing it out on your own' I want to encourage you to let other people give to you during this time. Especially other women. I found that so many women were helpful to me, taking me to chemo, talking with me, staying with me, helping me to just get through the exhaustion of chemo (and later radiation). I found it a great lesson. Do you try to do too much on your own? Please let people help you – and they want to help you to show their love and concern. Caring and nurturing behavior is what we can do as human beings for each other, for we have to trust the drugs and treatment to battle the cancer! I would like to ask Martina - how did you deal with the adversity of your cancer diagnosis? Did you pull away in order to deal with it on your own or did you immediately rely on family/friends? Big fan of hers!!! Much success always!! Great fan...thanks for the wonderful Wimbledon memories. Where has modern tennis gone wrong? Hi Martina, you've been a sensation to watch on the court all these years. On the cancer issue, my advice is for you to keep off all the publicity and get spiritual about it. Make an appointment with Bishop David Oyedepo of Winners' Chapel in Nigeria – cancer fears him! Martina, what did you do when you felt down or sad? Hi Martina! In my book you are truly Tennis' living legend.You have all the tennis titles tucked under your belt.My question is,being an athlete, we all know that athletes are the most disciplined,most healthy,most active people on earth,short of saying that it's nearly impossible for you guys to get sick.How did you take it when you first learned that you have cancer? Like the battles you have won on court,be it grass or clay,I know you will pull through and win your fight against cancer with an ace! My prayers are with you Martina.Godspeed! there is only One person that Understands your pain more and cares so much more than all of us that are feeling for you, i dont know if you know him.. JESUS.... if you dont please try and do, he will help you, whichever way you dont battle with anything again after your 102 years on earth. Hey Martina...Hope such an adverstiy contributed you to fasten your faith and self-confidence.Now that you're cancer-free, how can describe yourself? Do you think you're special since God chose you ? What is the thing that has surprised you the most so far in this? hi Martina, you are an inspiration to many young people in the way you are fighting this,i wish you the best.Martina i want to ask you what was the best moment in your tennis career.thanks. You are just awesome! I've followed your game of tennis since I was a little girl growing up in Florida. Now I am a 47 year old women who is heading to remove a lump on Monday. I just pray that it is nothing serious. Just wondering if you have ever heard about the medicinal benefits of tumeric? A recent study has revealed the when mice consume turmeric, it prevents breast cancer from creeping into their lungs. Maybe we should think about sprinkling it on our everything we eat!Thank you Martina for making the game of tennis an interesting one! If you ever make it to Kuwait I would love to have the pleasure of meeting you! May you continue to find strength and great health in your life and may we pray for all of the other women who have fought this cancer and the ones fighting this at this moment. You are a true CHAMPION!